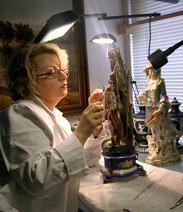 Art restoration and conservation is an important part of Grashe Fine Art Restorers. Utilizing traditional methods combined with innovations made possible by advanced technology, Grashe Fine Art Restorers has continued the tradition of past masters with a careful and conservative approach to art conservation and restoration. We have built up our reputation for a sensitive and critical approach to restoration and conservation based on nearly thirty five years of practice. The studio aims to restore the unity and integrity of each object of fine art through minimal intervention. In depth art historical and technical research is carried out in order to develop treatments, in addition to full photographic documentation for each project. Michael Grashe was born in Moscow, Russia in 1949. Graduated from Moscow Academy of Fine Arts in 1972. Postgraduate from school with PhD in 1975, becoming a Member of The Russian Academy of Fine Arts. Michael's internships and apprenticeships included training at the State Tretyakov Gallery and Rumiantsev Museum in Moscow, Russia; Hermitage Museum in St. Petersburg, Russia; Dresden Museum of Fine Arts, Germany; Art Museum, Gerona, Spain. Immigrated to USA 1976. Practicing Fine Art Restoration and Conservation in US since 1977. Maria Gradskaya, born in Odessa, Ukraine in 1967. Graduated from Grekov School of Fine Arts in 1983. Background includes multiple degrees in Fine Arts Conservation and Restoration. Apprenticeships include training at the Odessa Museum of Fine Arts and Kiev Museum of Western Art. Practicing Fine Art Restoration and Conservation in US since 1995. We perform professional quality art restoration and conservation on paintings, icons, porcelain and ivory, marble, jade, enamel, works on paper, antique and contemporary frames, gilded objects, murals, and sculpture. Please visit Grashe Fine Art Restoration Services in Seattle webpage for a complete list of services we provide. 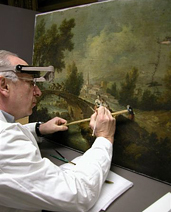 No matter how severe the damage, our professional conservators at Grashe Fine Art Restorers can properly restore objects of fine art or deteriorated paintings with worn or even ripped canvas, flaking pigment and discolored varnish. After carefully examining your painting, a complete evaluation of its condition and a cost estimate will be provided before any work is started. All estimates are based on time and material, not on the value of the piece. Please Contact Us to see how we can put our experience to work for your next restoration project.